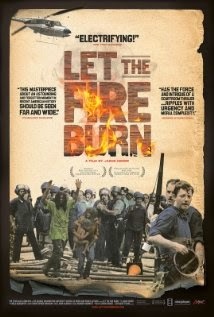 Movie Review: “Let the Fire Burn” sharply exposes how some controversial and contradictory decisions made by the Philadelphia Police Department conjointly with politicians in charge, were in the basis of a big fire that, in 1985, killed eleven members of a small urban group known as MOVE. This radical movement was founded by John Africa, a charismatic leader whose followers compared him to Jesus Christ. They believed in a non-aggressive posture, ‘green’ politics and a simple way of living, exposing the lie of the political system, as well as opposing to technology and science. This pacific behavior changed radically after a baby has been killed during a police raid, with the members of the group arming themselves with guns from that time on. In 78, a police attempt to vacate the reactionaries from their headquarters ended in a shootout that victimized a police officer. Nine MOVE members were sentenced, while the impressionable brutal violence used by the police remained unpunished. In their new headquarters, on Osage Ave., MOVE people became provocative and were subjected to several complains regarding child neglect, sanitation issues and harassment. All was finished on May 13, 1985, when the authorities decided to drop a bomb on their roof. Using exclusively old footage together with a superior form of narration, the disturbing “Let the Fire Burn” confronts every aspects without come to a conclusion (except for the police incompetence). Outlaws or innocent victims? Well-intentioned or terrorist cult? You decide!